Access: On the Menu bar, click Project. Available options before a project is loaded or created. Available options once a project is loaded or created. Opens the wizard to create a new project. For step by step instructions about how to create a new project: Step 2. Creating a Project. Opens an existing project. 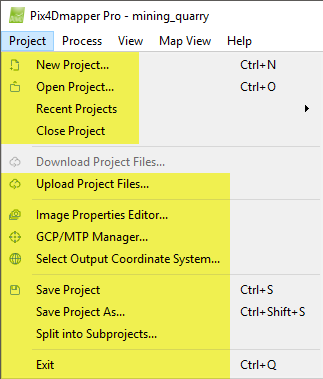 By clicking Open Project, a pop-up appears to navigate and select a .p4d project file (Pix4Dmapper project file format). Displays a menu with the 10 last projects that have been opened. By clicking on one of them, the project will open. Allows to download and load a project previously uploaded to Pix4D Cloud. This option is enabled when the software is opened and disabled once a project is loaded or created. For step by step instructions: How to download / open a previously uploaded project. Upload and process a project on Pix4D Cloud. Saves the status/properties and configuration of the current project. Important: This option saves any change made since the project was opened and saved for the last time. The .p4d project file will be updated with the current state of the project. This has no impact on other files such as input files or output files. Output files will be modified/created only when processing. Save the status/properties, configuration, and results of the current project into another location and/or with a different name. 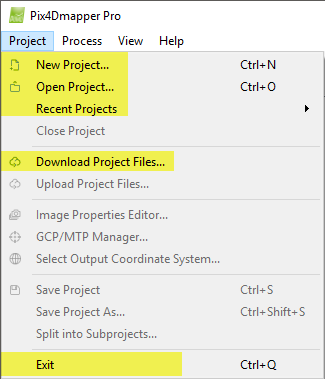 Important: If a different project name or path is selected, this option will save a copy of the project in the new location using the new project name. A new .p4d project file will be created and saved with the same information as the current project. Once this new project is created, any changes made and saved with the option Save Project will not be saved in the original project. Only the new project will include all the changes. Allows to automatically split the project into subprojects by creating different .p4d files. Each .p4d file contains the images for the created subproject. The different subprojects overlap, therefore, some images will appear in more than one subproject. Important: Only aerial projects with geolocated images can be split. Maximum Number of Images: Defines the area to be used to split the terrain into subprojects. When selecting for example 100, a subproject will cover the area from 100 images plus some area and images from neighboring subprojects so as to ensure there will be overlap between them. Suffix of the Subproject's Name: Text to use as suffix for the subprojects. Each subproject will be named as projectname + Suffix + Number. Important: All the Manual Tie Points, GCPs, Check Points and Objects created in the original project will be copied into all the generated subprojects. Closes the project and exits the software. Click Save to save the changes and exit, Discard to exit without saving, and Cancel to keep the software open.